This USB 3.0 Laptop Docking Station delivers display flexibility, fast charging, and desktop convenience to your home or office workstation. Using a single connection, the dock instantly adds two DVI ports plus HDMI and VGA adapters, a USB 3.0 hub with two quick-charge ports, Gigabit Ethernet, and a 3.5mm headset jack to your laptop. It's the perfect accessory for virtually all USB 3.0 equipped laptops (for example, the Dell Latitude 13 7000 2-in-1, Microsoft Surface Pro 4, Surface Pro 3, or Surface Book). Display Flexibility Discover multi-monitor freedom! Boost your productivity by adding dual monitor support to your workstation with one of the only docking stations to offer dual DVI video ports each delivering resolutions up to 2048x1152. For extra display flexibility we’ve included two DVI video adapters, letting you avoid the frustration and costs of purchasing additional products just to fit the displays you already use. Leave the stress of interface limitations at the door by adapting to the most popular monitor types right out of the box. No hassle, no headaches. With a range of video output options, the dock is ideal for hotel desks or hot desks. Device Charging Charge your mobile devices faster, with or without a laptop connected to the dock. USB charging is convenient, fast, and accessible through two front “always on” USB fast-charge ports, combining data throughput with support for USB Battery Charging Specification 1.2 — You can simultaneously maintain work efficiency while adding charge and sync flexibility for up to two mobile devices (2 tablets or 1 tablet/1 smartphone). Now, you can easily charge other devices while connected to multiple displays, a Gigabit network, and numerous USB peripherals through the integrated 5-port USB 3.0 controller. Perfect for external USB 3.0 hard drives, the docking station supports UASP-enhanced performance for faster data transfer rates, which means less waiting and more productivity. Desktop Convenience Save time and get more work done! With a single connection to your laptop (e.g. MacBook Pro, MacBook Air, Lenovo ThinkPad, HP or Dell Ultrabook) your required peripherals remain connected. Overcome your laptop port limitations and reduce the hassle of constantly reconnecting devices, to create an organized and full-sized workstation with less clutter that's great for hoteling, or hot desking. Plus, for a clean and customized workspace you can position the docking station in horizontal orientation, or upright (tower), using the included optional stand. Universally Supported Unlike some proprietary docking stations designed only to work with specific laptop models, this universal laptop dock works with multiple brands. All you need is your laptop’s USB 3.0 port and you can be up and running quickly. With universal support, you can use this dock with different laptops now, or in the future. 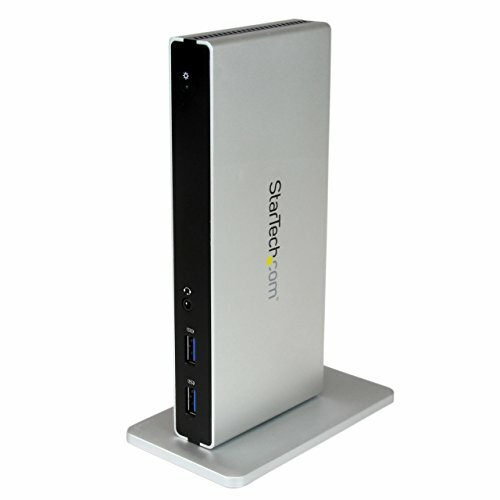 The USB3SDOCKDD is backed by a StarTech.com 3-year warranty and free lifetime technical support.